This salad is so refreshing, simply eating it feels as though you’re doing your body some good. The lemon in the salad gives it a wonderful zesty tang which would make this salad the perfect accompaniment to fish or chicken to serve at a BBQ. The drizzle of honey balances the acidity in the dish and helps marry all of those beautiful flavours. Cook the quinoa in some salted boiling water for around 15 minutes, or according to packet instructions. Rinse with some cold water and set aside to drain. 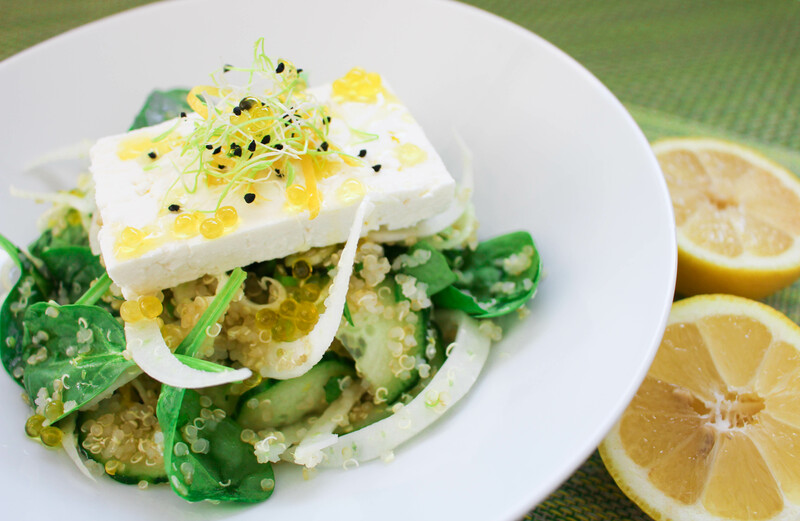 Using a mandolin or a sharp knife slice the onion, fennel, apple and cucumber and place those ingredients in a large mixing bowl along with the spinach, fresh herbs, feta, lemon juice and zest. Now add the cooled, drained quinoa, a splash of white balsamic vinegar,, the honey, a splash of olive oil and some salt and pepper gently toss the salad. This salad is best freshly made as the longer it sits, the more the vegetables will wilt and become soggy so get in there fast !